Saturn's moon Tethys displays its distinctive dark equatorial band here, along with two sizeable impact craters in the west. The larger crater to the north is Odysseus, which has a diameter (450 kilometers or 280 miles across) that is a substantial fraction of the moon's width. Tethys is 1,071 kilometers (665 miles) across. Several moons in the outer solar system have large impact features like Odysseus, and scientists are interested in learning how such powerful impacts have altered the moons' surfaces. 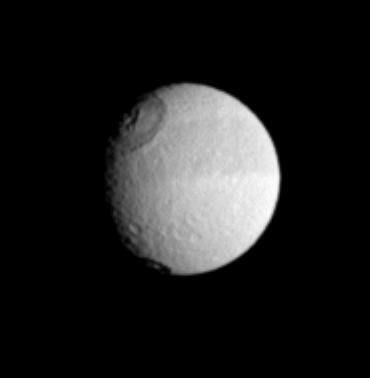 The image was taken in visible light with the Cassini spacecraft narrow-angle camera on July 10, 2005, at a distance of approximately 1.8 million kilometers (1.1 million miles) from Tethys. The image scale is 11 kilometers (7 miles) per pixel. The image has been magnified by a factor of two to aid visibility.